I was honored to be asked to take part in a survey from Learn Mandarin Now that polled China bloggers on the best resources they used in learning Mandarin Chinese. Take a look at the great infographic they put together with the poll results, and be sure to read the accompanying article for more ideas on how to get Mandarin in your noggin. Learning Mandarin Chinese has seen a huge upswing in popularity over the last few years—but have you worked out the best way for you to begin to study the language? Well, to help you find some direction, through our blog, http://www.learnmandarinnow.com, we recently made contact with 50+ top bloggers and asked them about their preferred resources they use to learn Chinese. Many made similar recommendations so we decided to create an attractive, colourful Infographic for ease of presentation—and now feel it’s the time to share this with you all! 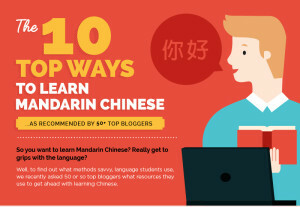 If you are serious about learning Chinese, reading our Infographic is a great way to start! Enjoy the infographic and the article, and I’d love to hear what resources you found helpful in your Mandarin learning journey!